I have created a Savegame Editor for the computer game GTA San Andreas. With this application you can open savegame files and edit some things, like the amount of money you own. The current version, 3.2, was released on April 6, 2013. The downloads without 3d support were added on August 8, 2014. Here is a table with downloads for various systems. Note that it is possible that you need the 32-bit version even if you have a 64-bit operating system, so just try them both. 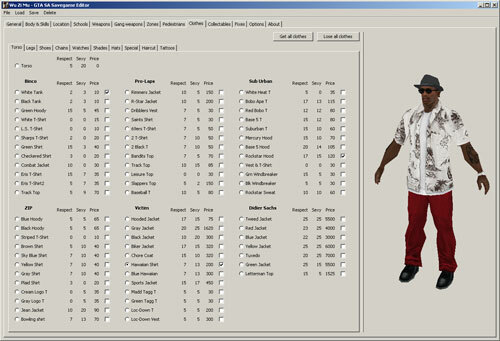 On some computers the editor doesn't work because something goes wrong with the 3d view of the clothes. If you get an error, try the 'without 3d' version. Sorry for the complicated download/install :). Open the zip file, then extract all the files to a directory. In that directory, double click "editor" or "editor.jar" to run the program. If it doesn't work, check if you have installed Java. You need Java 6 or higher to run the program. Go to www.java.com to download Java. If, on Windows, you have Java installed, but opening "editor" or "editor.jar" doesn't execute the program, running the program Jarfix may fix the problem. You can here subscribe to the mailing list. If you are on the mailing list you will get an email when I have important news about the editor. This project is currently given new life! Visit this project on Github to join development or see the latest updates. On Github is also documentation about the savegame file format. You can download the source code of this version.